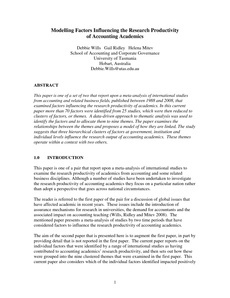 This paper is one of a set of two that report upon a meta-analysis of international studies from accounting and related business fields, published between 1988 and 2008, that examined factors influencing the research productivity of academics. In this current paper more than 70 factors were identified from 25 studies, which were then reduced to clusters of factors, or themes. A data-driven approach to thematic analysis was used to identify the factors and to allocate them to nine themes. The paper examines the relationships between the themes and proposes a model of how they are linked. The study suggests that three hierarchical clusters of factors at government, institution and individual levels influence the research output of accounting academics. These themes operate within a context with two others.